Note: Because this is a re-review, there will be book spoilers. My original review of The Way of Kings is spoiler-free. I admit it: I didn’t want to reread this book. It’s long. Over 1000 pages. And back in 2012, when I read it the first time, I struggled with a good chunk of it. (The first 400 pages, my original review tells me.) I love Sanderson, and I enjoyed this book, but it wasn’t nearly the adored-reading-experience I had with some of his other novels. 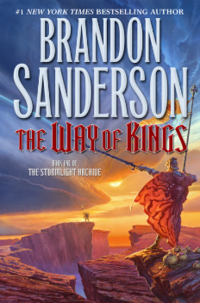 Unfortunately, I put off reading Words of Radiance (book 2) long enough – too intimidated – that when I tried to read it, I had no idea what was going on, and didn’t recognize the characters. A reread was in order. My memories of The Way of Kings were vague. I remembered Kaladin and a tiny bit about how he was made a slave, and I remember a few little things about his bridge crew. I remembered a storyline about a scholar and her ward, and the assassination attempt on the scholar’s life by a fake priest, though I remembered no names or details. I remembered Szeth’s name and generally how he was used in the book. I remembered Hoid telling a long story at night. I didn’t remember the Parshendi, or why there was war, or that spren existed at all, or most character names. My impressions were vague: some twists and betrayals, a few memorable scene snapshots, and my annoyance that a huge chunk at the end left out the scholar-plotline (my favorite). I chose the audio format for my revisit, despite the 46-hour length. In a way, I think I was ready for a big long intricate chunky reread. The book was much easier to get into this time around – probably because I recognized a lot of the world and story as the reread went on – and I enjoyed the cinematic quality of the book-read-aloud. I often find that books stick better in the long run if I listen to them, and I think that may be the case here, too. While I still didn’t love it as much as Mistborn, I certainly loved it far more this time around. And I was eager to dive right into the 49-hour audio sequel. Spren are fascinating and I can’t wait to understand them better. I was still annoyed at the long absence of Shallan and Jasnah in the latter quarter of the book. The symbol-headed creatures scared the crap out of me. Creepy. I can’t believe I didn’t remember them at all! The revisiting gave me a wider perspective on the events here, so that I understood much more of the motives and timelines and historical stuff. I get really tired of battle/fighting scenes. Yes, this is a book about a culture at war. Yes, the fighting is an important part of many of the main characters’ lives. Yes, Sanderson writes these sections well. BUT. I just get bored when the fighting goes on and on and on. This was particularly noteworthy during the long absence of Shallan and Jasnah. I’m still totally in love with Sanderson’s attention to group friendship dynamics. He is the very best at writing those! As for the audio performance, read by Michael Kramer and Kate Reading: I enjoyed it more than expected. Reading is one of my audio favorites, but Kramer isn’t. I liked the way he read this one, though, and I think I’ll continue to listen to this series when I can. Though I’ll still buy the books, because illustrations. This entry was posted in 2016, 2017, Adult, Prose and tagged audio, callback, divinity, reread. Bookmark the permalink. I read the Mistborn books and loved them but haven’t had the urge to try another Sanderson series yet. They definitely take a lot of investment. Very much – though admittedly, Words of Radiance (the second) took almost no time at all. I sped through that audio in five days, WAY overdoing it, heh.